In expanded form of a number, the number is shown according to the place values of its digits. Thus, 2000 + 300 + 80 + 5 is the expanded form of 2385. 1. Find the expanded form of 453169. We can write the expanded form of numbers in different ways. ● Names of the Numbers. ● Numbers Showing on Spike Abacus. ● 1 Digit Number on Spike Abacus. ● 2 Digits Number on Spike Abacus. ● 3 Digits Number on Spike Abacus. ● 4 Digits Number on Spike Abacus. ● 5 Digits Number on Spike Abacus. ● Problems Related to Place Value. ● Expanded form of a Number. ● Example on Comparison of Numbers. ● Successor and Predecessor of a Whole Number. 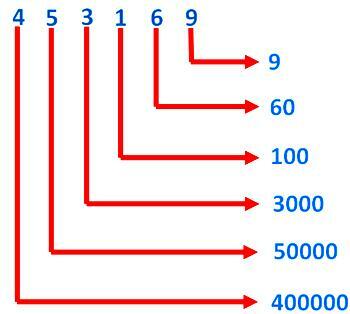 ● Formation of Numbers with the Given Digits. 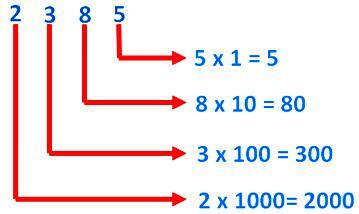 ● Formation of Greatest and Smallest Numbers. ● Examples on the Formation of Greatest and the Smallest Number.